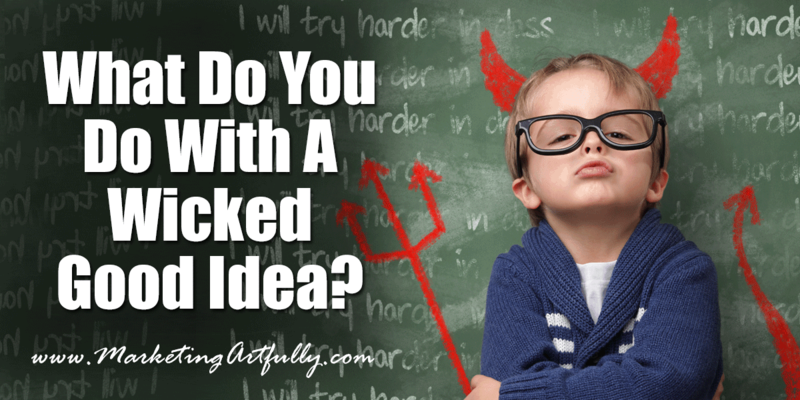 You are here: Home / mindset / What Do You Do With A Wicked Good Idea? We have to talk about something really serious today because I am grumpy. I have been getting a lot of feedback lately that is not complimentary about all my great ideas. Somehow having lots of ideas has been turned into a bad thing or a chore. In fact, I have been hearing that people have to coach themselves to figure out 10 new ideas a day. Crap, I could have 10 ideas an hour if I set my mind to to it! If you are a rebel entrepreneur (like me) your problem isn’t that you don’t have enough ideas, it is that you have too many ideas. They bang around up in your brain, taking up productive work cycles and trying to knock you off the task you are currently working on. They wake you up in the middle of the night and won’t let you go back to sleep. They are pesky little devils sitting on your shoulder saying “use me, use me”. When Did Having Ideas Become A Bad Thing? So today I am celebrating new ideas. I am expressly giving you permission to ignore all the naysayers and critics and just have tons of glorious, impractical and frivolous ideas! I KNOW, we are all busy and can’t act on every one of our ideas, but this concept that we have to somehow stifle or be ashamed of them is crazy talk. Go to Starbucks, think about stuff, dream and plan to your hearts content! That said, if all you do is jump from one idea to the next as they come into your head, you will make you and everyone around you crazy. Ideas need a little time and space to develop into BIG Ideas that you might want to implement. With this in mind, I have developed a whole system to walk Rebel Entrepreneurs through the idea process and making sure that your really wicked good ideas come to fruition! I have had people ask why there are so many pieces and moving parts which is a valid question! The reason you are frustrated now is that you are doing this all in your head anyways. You are “working” on bits and pieces of all kinds of ideas all willy-nilly and so your brain is constantly telling you that things need to get done without a clear plan for actually doing what really matters. I have an ideas sheet that I use to record ALL of my ideas. If I have a thought, I put it down on one of my ideas sheets. They are separated into different areas like ideas for my main business (Marketing Artfully), my Etsy shop (Paperly People), forms I want to make and then a general one. If I get an idea for a blog post, it goes on the blog post Idea Sheet in my planer under Marketing Artfully. This sorting function allows me to be really focused when I am working. Instead of sifting through ALL of the blog posts I might write, I just focus on the ones that I would put on this blog. The cool thing about these is that I can have a million ideas if I want. They are just words on pieces of paper so they are not hurting anyone (including me). Plus the act of writing them down means that they are out of my head and won’t bother me when I have actual work to do! While I use the Ideas Worksheet, you can start this with just a piece of paper and a pencil. Just start jotting down all your great ideas. You will start to see patterns develop as you go and then take them off that sheet and make them their own new categorized sheet. As you start recording your ideas, you will find one or two ideas that will just not go away. You start thinking that they may become something that is really important. These ones should be moved over to a BIG Ideas sheet. Who are you marketing to? If you can’t figure out who would want to buy your idea, then you should probably hold off developing it until you are a little more clear. If there isn’t a clear buyer for your product or service it is going to be very hard to sell. Do you have this audience already? It is fine if you are making something for a totally new audience, just know that it is going to take more work than if you are selling something that matches your current client list or database. Price. At this point it might not be set in stone, but you really do need a ballpark so you can know how much time to devote to this endeavor. If you are selling something that will be thousands of dollars there will probably be way more moving parts to it than if you are selling something that is just twenty or thirty bucks. Action Items. Now you want to start breaking your idea down into action items that you will need to take to make it a reality. There are a bunch of spaces so you can really get an idea of the scope of the project. Don’t get all hung up on doing these “in order”, just let your mind roam free to be sure that you are aware of all the moving parts your idea will have. The super neat thing about this step is you are not DOING anything right now, you are just figuring out all the action items that you would have do to implement it. If you get done with this and feel that it is too much work or that you won’t like it, just don’t do it! BUT if figuring this all out just fired you up even more, you will move onto the final step! Each of the action items on the BIG Ideas sheet now becomes a little project by itself. If you had three action items, you will have three little projects pages. Just transfer the items from the BIG Ideas sheet over and start working on them. There are some questions here too! Due date. If you don’t set a timeline for finishing the Little Project, there is no way you are going to move ahead smoothly with your BIG Idea. If it seem like it will take too long to finish, you probably did not break your BIG Idea down into small enough steps. Price. Will there be any cost to implementing this step? I have talked to so many people who got their product to market and then realized they had no money left over for sales and marketing. Keeping track of your finances throughout will help you avoid this pitfall. Materials. I am sure that there will be some kind of cost, either money or time. Because I am in a service industry, my cost is generally time which is an even scarcer commodity than money is. It is important that you are aware of what you are “spending” whether it be money or time. Action items. These are the action items that you have from your BIG Ideas sheet which will be the implementation stages of your idea. When you have all your little projects done, your BIG idea will be completely finished! There are little square boxes throughout this system. Those are so you can record the state of the item. If you haven’t done anything with it, just leave it blank. If you have started it, color half of it to let yourself know that something has been done. If you black it completely out the item is finished. I have to say that just doing this one thing has changed my life greatly. Now I can leave a project and not spend most of my time trying to figure out where I left off. I just know that the items that are not filled in still need to be done! Now you are probably thinking that something like this would cost a FORTUNE! But wait just a minute… I don’t think having ideas should cost a fortune so I sell the whole thing for $7. Yes you read that right, seven bucks! Who is dating to be disparaging to you about too many ideas?? Creative people always have tons of ideas! They are just jealous! 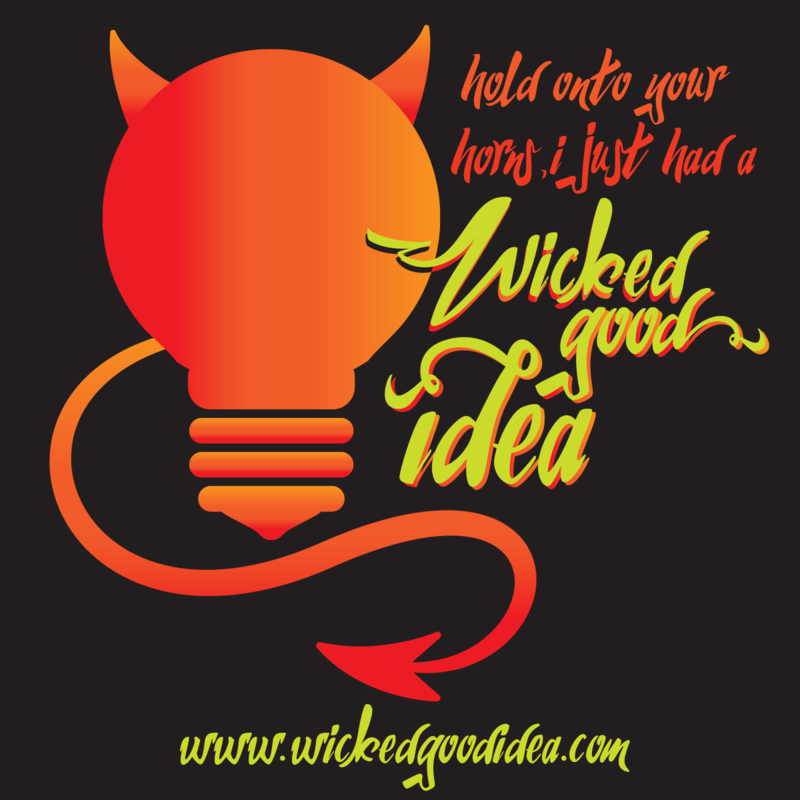 That being said, your Wicked Good Idea System is am awesome way to focus that creative mind! I love mine that I got from you, I know that much! I know right?!?!? It is a shame that there is so much animosity towards having lots of great ideas!!! Damn them and their judgmental-ness! !